TouchBase Pears is an independent, multi-purpose, community hub based in Selly Oak in Birmingham. TouchBase Pears was designed by the charity Sense, which supports people who have complex disabilities, including deafblindness, to communicate and experience the world. TouchBase Pears have just launched an inclusive theatre programme designed for young children, however as TouchBase Pears is an inclusive venue, all are welcome. With high quality productions from experienced children’s theatre companies, every show at Touchbase Pears will take place in a “relaxed performance” environment, inclusive to all and including BSL interpretation and/or multi sensory communication at all performances. The performances will run from April through to July 2019. Based on the much-loved Moominland novels by Tove Jansson, this gentle heart-warming show tells the story of a year in Moominvalley. Each section of the story has an interactive element; audience members have a snowball fight, toast marshmallows around a fire and go sea-swimming. The characters of Moomintroll, Snufkin, Little My and Thingummy & Bob are brought to life with 2D rod puppets and life size 3D puppets. The show uses beautiful original music and songs, and pre-recorded narration. The iconic Tove Jansson illustrations are recreated in a magical pop up book. The very young won’t sit still to watch a show and we don’t expect them to. Egg and Spoon is an interactive romp through the seasons where you come in and out of our magic circle and get to open all the gifts of nature. We’ll run through the rain and the falling leaves and sleep under the snow till Spring wakes us up for the butterfly party. Egg and Spoon is a perfect gentle introduction to the magic of theatre. Mathilda is a little grey sheep in a little grey world. When an orange balloon makes a surprise appearance on the farm, Mathilda discovers there is more to who she is than being a grey sheep! 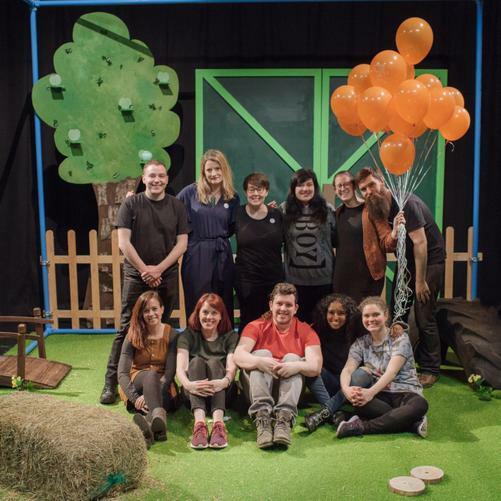 With a diverse cast of Deaf and hearing actors, Mathilda’s tactile, fully realised world is welcoming and fully accessible to Deaf and hearing children and families through the use of spoken English, sign language, and creative captions and animation. Join us in a world of buckets, castle building, spinning and tumbling in this delightful show which explores sand in new and exciting ways. 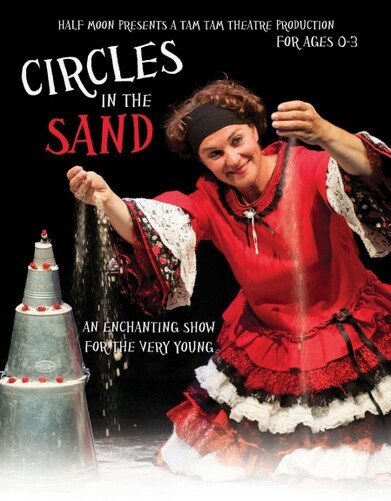 With no words, and accompanied by an evocative soundtrack of world music, Circles in the Sand is an intimate, imaginative and captivating show, providing the perfect introduction to theatre for the very young. At the end of the performance, children are invited onto the stage to delight in the feel of the sand as it trickles between fingers and toes. TouchBase Pears is a fully accessible environment with level access, on site parking including reserved Blue Badge holder spaces, accessible toilets including some with hoists and changing beds, and a welcoming team of staff. All performances include a range of communication methods, which vary by production and the audience can use their own technology (without sound) if this helps audience members to enjoy the production. A touch tour/familiarisation session is available in the space (30 minutes) before each performance. A visual story for the event will be available via email from 2 weeks before the performance date. I’ve teamed up with Touchbase Pears to offer a prize of a family ticket, which allows entry for two adults and two children which can be used for any of the shows (subject to availability). Enter via the Gleam widget below. 4. Promoter is responsible for fulfilling the prize and full contact details of the winner will be passed onto the promoter.